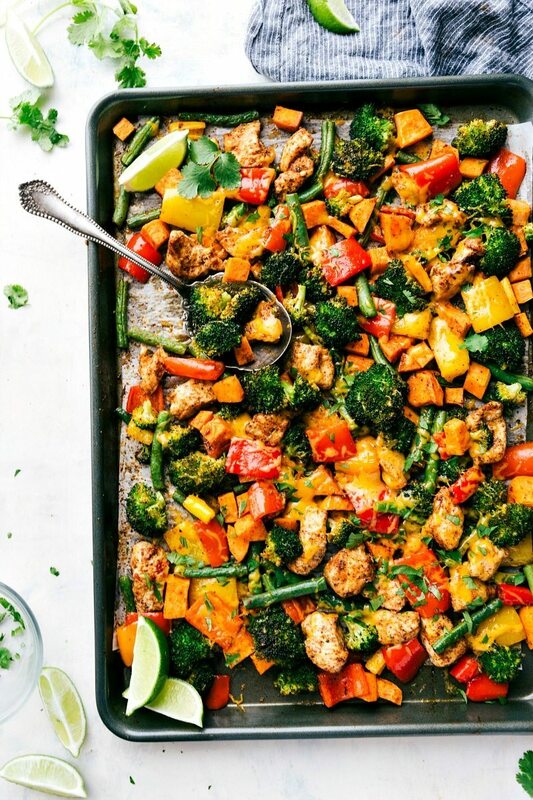 A sheet pan dinner with chicken, tons of veggies, an easy seasoning mix, and cheese! Healthy, hearty, easy to make, and so delicious! When the toddler told me I was a boy a few weeks ago, I knew it was about time to start talking about genders. He’ll now consistently tell me I’m a girl, he’s a boy, the baby is a boy, and dad is a boy. When I quiz him about others, however, he’s not too consistent. He’ll get both sets of grandparents right generally, but he definitely struggles with his aunts & uncles. “No, Grey, she’s a girl,” I responded. If you watch the video tutorial for this recipe (at the top of this post), it is 90% done by him! 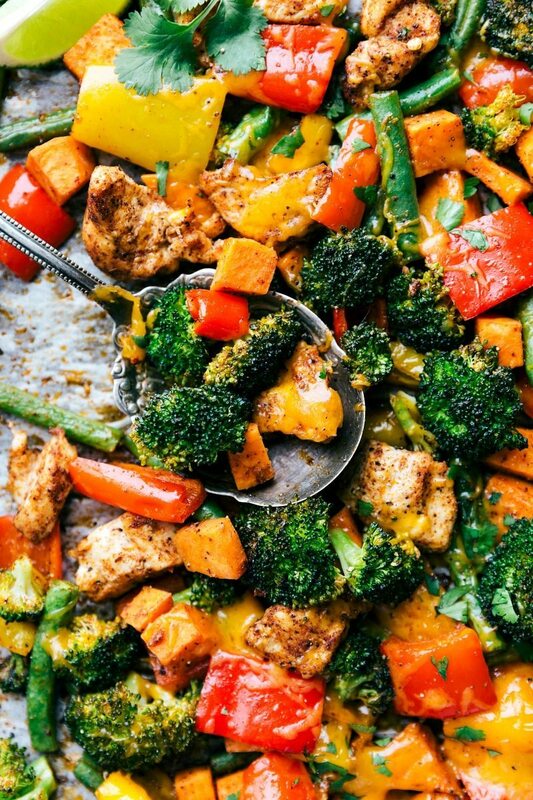 And he ate about 45% of this one pan veggie + chicken dinner…so much for meal prepping with it. ? 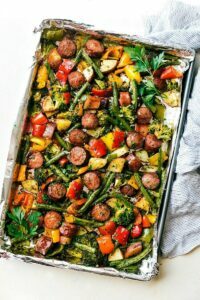 This sheet pan dinner is easy to make and good for you! 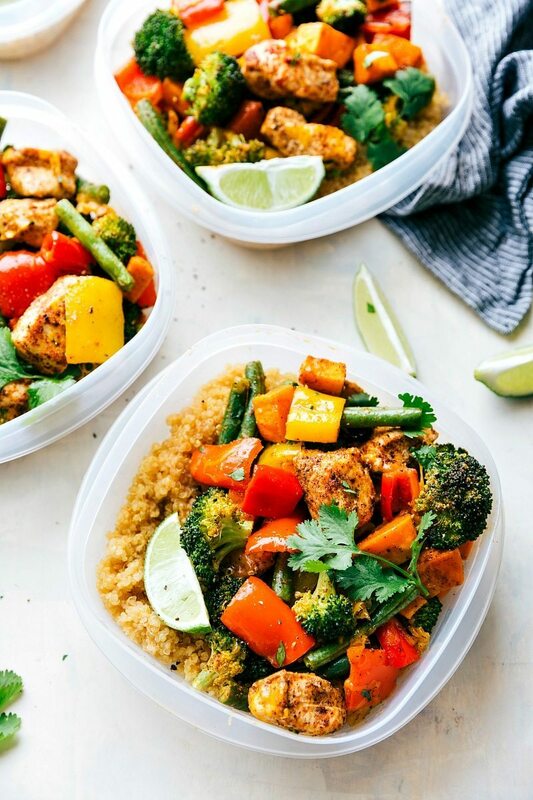 It’s the perfect thing to make if you are looking for meal prep options. In all the things I’ve learned (my experience + my undergrad degree), the number 1 tip I’d give for eating healthier? Being prepared. And by being prepared, I mean making healthier snacks ahead of time, meal prepping for the week, getting rid of the junk food in your house, and preparing high protein meals that are packed with veggies. This meal is a great way to start with meal prepping. It’s healthy, but absolutely NOT lacking in flavor. It’s got a hint of spice (I’d still say it’s pretty mild) and that spice is evened out with the cheese. The cheese in this dish is optional, but if you aren’t trying to save calories, I’d definitely recommend adding it! Enjoy! Preheat the oven to 425 degrees F and line a very large sheet pan with parchment paper and set aside. Chop the chicken into 1/2 inch pieces. Remove the stems and seeds and coarsely chop the peppers. Cut the beans in half. 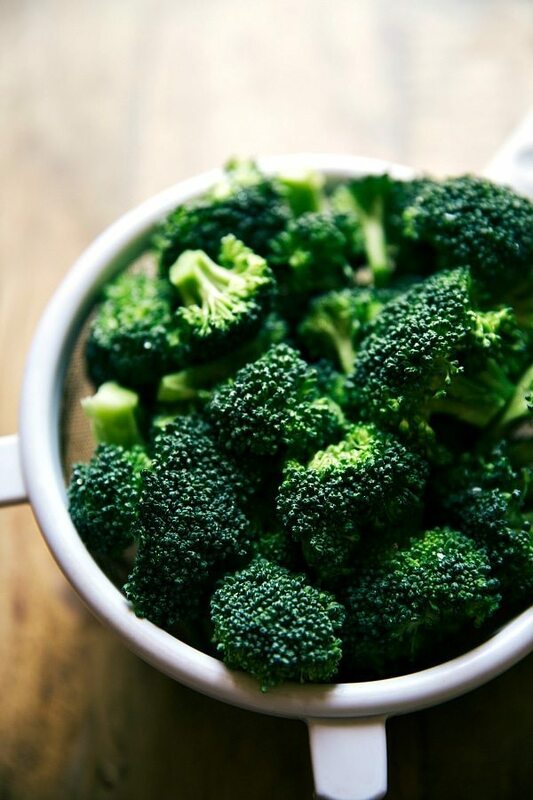 Coarsely chop the broccoli. Place all the veggies* and chicken on the sheet pan. In a small bowl, combine the olive oil and all of the seasonings listed and mix. Pour the seasoning mixture over the veggies and chicken and toss with your hands until everything is well coated. Spread everything into 1 even layer. Remove from the oven and top with the cheese if desired. Return to the oven for 1-2 minutes or until the cheese is melted. Remove and enjoy over cooked rice or quinoa and with fresh cilantro and a lime wedge if desired. 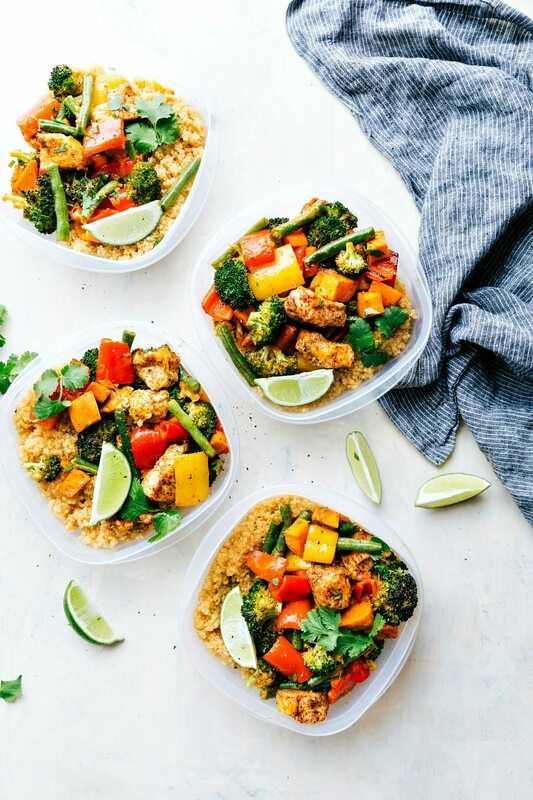 MEAL PREPPING: Place an even amount of quinoa (I cook 1 and 1/2 cups dry quinoa) into the bottom of 4 different containers. Divide this baked chicken and veggie dish equally in 4 parts. Top each container with fresh cilantro and a lime wedge. Cover and place in the fridge. Enjoy within 4 days. *If you want really well roasted/more tender veggies, bake them by themselves for 10 minutes before adding in the chicken. We like the veggies to be crisp tender (especially when using this dish as a meal prep) so I toss them with the chicken at the start. OMG! 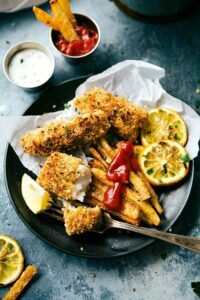 This is my favorite type of dinner, simple, healthy, filling, and so easy! Count me in! Do the nutrition facts include the quinoa? I made this tonight for my in-laws and it was a big hit with everyone (except the 6 yo)! The Sweet Potatoes were my favorite part, so I’d add more of those next time. I left off the cheese and lime then served it with brown rice. I also separated it into 2 pans and it fed 9 people with leftovers. Is it possible to roast frozen veggies? This would both save a bit of prep time as well as ensure better quality veggies for some of us, but I’ve not been able to figure if it’s feasible. You can, but I do think it will be a bit soggy and less crisp. If you use frozen veggies, let them thaw 100% before cooking them and watch them closely because I think the cooking time will vary. The calorie count seems high for this dish. Does it include the rice/quinoa and cheese in the calorie count? It contains the cheese, but not the rice or quinoa! You’ll divide the total yield of this recipe into 4 equal portions and each of those portions is 1 serving size. the total fat is very high – do you think that is because of the cheese? Cheese and olive oil. 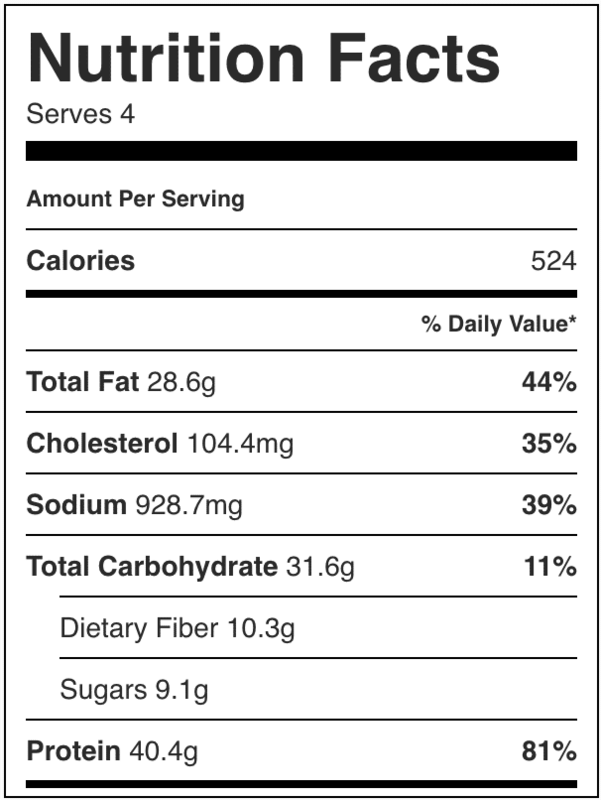 Note that the portions are very large (you’re getting a lot of food per “serving”) reflected on the nutrition label. Please email me the recipe for one pan chicken and veggies!!! Looks Devine!!!!! Made this ton it & it’s awesome! Added an extra swt potato & sliced onion…all served on brown rice..Wonderful! Thanks for sharing!! Yum so good! Made five giant portions. Looking forward to the leftovers tomorrow! Are there adjustments I could make to decrease calorie count? I know leaving off cheese would help, anything else. Do you know the calorie count if cheese is not added? I don’t know the calories without cheese, but leaving off the cheese will decrease the count as well as if you decreased the oil by a tablespoon! I made this last week, and couldn’t wait to make it again tonight. It may be the tastiest meal I’ve ever cooked! Looks good! Do you cook the chicken first? or do you put raw chicken in the oven with the veggies? I thought olive oil shouldn’t be used for cooking at high heat. Will coconut oil work as a substitute? My family loved this! My toddler loves cauliflower and bell peppers, so I swapped out the broccoli and added purple cauliflower. I also tried b/s chicken thighs and it worked really well, so flavorful! This is a keeper for sure. I made it for dinner last night but will eat the leftovers for lunch this week. One of my favorites, thank you! You are welcome! I’m thrilled this has been a hit 🙂 Thanks for the comment Jessica! This was amazing!!! My husband liked the kick! I thought I would have some for lunch, but it didn’t last in my home!! I’m sorry to not be of more help, but I’ve never tried freezing this dish. I don’t love frozen (and thawed) roasted veggies, so I’m not sure it would be too amazing after being frozen, but I could be wrong! Did you season or add anything to the quinoa? If so what did you use? Whenever I cook quinoa to be a base for a dish, I cook it in chicken stock (or broth) and add some salt and pepper. You can (if you want) add some fresh lime and cilantro to the quinoa for this dish! And enjoy we did!! This was soooo delicious. Not too spicy at all, just enough kick. I left off the cheese and didn’t serve it with any rice or quinoa. Thanks for this wonderful recipe! It looks and smells great! Super easy to make! I did zucchini instead of sweat patatoe! I’m glad you liked! That sounds delicious! Hi! This recipe looks great! I was wondering if instead of roasting them in the oven can I grill them on a grill pan. I don’t own a micro wave. Do you have any other suggestions on how to precook the sweet potato or a substitution? You can use a different veggie in its place or leave it out entirely 🙂 Enjoy! Omg, looks amazing! You made me hungry and it’s still dinner time here! Love love loves all your recipes, you are truly inspirational, I don’t know how you do it. Thanks, Keep it up. This recipe was a lifesaver! I was eager to meal prep and this was a perfect recipe for this. My 15 month old daughter was obsessed with it, especially the chicken and sweet potatoes and my hubby said he could eat it everyday. Win win! Thank you!! So good. Just made this tonight. The flavor is incredible. I left out the green beans and added petite carrots instead and served with garlic couscous. Definitely a keeper. Why use white sugar as opposed to brown sugar? Thanks for sharing this recipe. It is indeed savory, delicious, and so healthy! I didn’t anticipate so much flavor, but the spicy mixture is amazing! 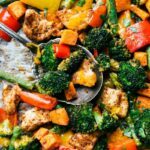 I just found this recipe on Brucrews site while looking at their curry shrimp. Love the sound of this and the meal prep, which I definitely need to start doing. thanks for this easy, healthy recipe!! This looks good but you really need to make one change… omit the sugar from the seasoning!!! This is the only reason I didn’t go 5 stars! Sugar shuts down the immune system for about 3 hrs after consuming and sugar feeds infections. It’s not necessary in this recipe and if you really want a sweetener, use a little honey! Sugar is in everything these days, even things you wouldn’t think of because it’s addicting! As a newbie to meal prepping do you heat this up to eat? And also how long does this keep in the fridge for? Thanks! Yes heat it up before you eat! 🙂 And it should last 4-5 days! Excellent as is! I paired with couscous (seasoned with butter, salt, and pepper). This is one of my new favourite recipes! 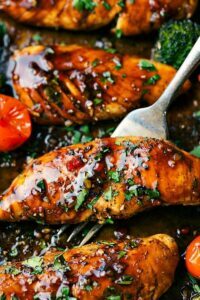 It’s so easy to throw together, tastes amazing, and is great for meal prep! I just moved to England from California and this is my new healthy comfort food 🙂 Thanks for sharing! !